It’s highly likely that the first quartet into next month’s Country Championships Final at Royal Randwick won’t start again before they race for $500,000 on April 7. Jenny Graham and Danny Williams told Racing NSW their qualifiers Victorem, Awesome Pluck (Graham), Kopi Luwak and Pumpkin Pie (Williams) have enjoyed an easy time since earning their Final berth. Graham, whose horses qualified at Port Macquarie on February 18, said she’s still finalising plans for both her smart three-year-olds given she has the longest wait time to deal with. “Victorem definitely won’t have another race though Awesome Pluck I’m not sure about yet,’’ she said. 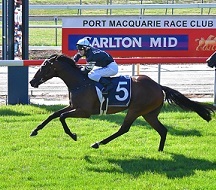 Victorem wins the opening Country Championships Qualifier at Port Macquarie. (Pic: Ivan Sajko). Graham said Victorem, Awesome Pluck and Port Macquarie third placegetter Portatorio ventured to Taree on Monday for an 800m jump out. Portatorio will line up in the $50,000 Wild Card (1280m) at Muswellbrook on April 1 in an attempt to force his way into the final 16. “I want to keep them ticking along and make sure they do a bit without doing too much,’’ she said. Williams, of course, took nine horses into the Goulburn Qualifier on February 24 which saw Kopi Luwak defeat Pumpkin Pie while odds-on favourite Don’t Give A Damn ran the worst race of his career finishing tenth. He confirmed neither of his qualified runners will have another race start and is happy to use trackwork and jump outs to keep them fit. The pair, along with Don’t Give A Damn, have enjoyed a few days in the paddock and returned on Tuesday to continue their march to Randwick. “We’ll assess them in the next week before making too many rash decisions,’’ Williams said. “Pumpkin Pie is such a tough nut, she’s come through the best of the lot. She really enjoyed a few days out in the yard. Don’t Give A Damn was ordered to trial following his failure which Williams has put down to a number of factors on the day rather than any injury issue. Kopi Luwak is the current favourite for the Country Championships Final. (Pic: Bradley Photos). Once he competes in a trial, either the 15th or 26th of March, Williams intends to send him to Muswellbrook where a return to form would probably see him reinstated as favourite for the Final. “He’s never really liked firm ground that much, he’s always a bit better when there’s cut in it,’’ he said. “He was good in the tie ups and we normally get him led into the enclosure. When we got to the enclosure he was pretty pumped because he didn’t have a clerk, I sent him out on the track straight away then he had to wait for what seemed an eternity. Kopi Luwak is the current TAB favourite for the $500,000 Country Championships Final (1400m) at $4.60 ahead of Suncraze ($6), who will attempt to qualify at Scone on March 18, and Victorem ($6). 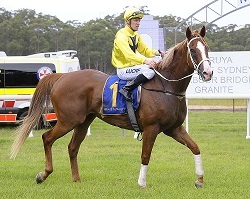 Pumpkin Pie is next in line at $8 along with the Matthew Dunn-trained Snitz, who races for his spot at Grafton this Sunday, with Don’t Give A Damn, once the $2.90 favourite, at $11.